This paper describes a pilot application developed by the authors within a project in the area of elders assistance. Specifically, the work addresses the problem of assigning scheduled activities to a set of volunteers by means of an interactive tool that considers both users’ needs/preferences and constraints posed by the organization that manages the volunteers. Particular emphasis is given to the problem of assigning a group of seniors to the “right task” so as to obtain a positive outcome of the services offered by the volunteering association while maximizing the volunteers’ level of satisfaction perceived, in this domain, as a relevant requirement. 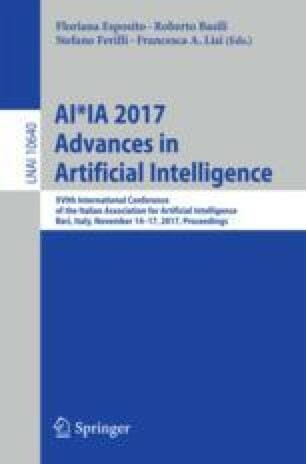 This paper describes the design of a complete application for supporting this process focusing, in particular, on the back-end functionalities where a formalization as a generic optimization problem and a heuristic, developed to serve the time constants required in the domain, have been integrated. Experimental results, conducted with realistic data, support the particular design of the solution and encourage future work. Authors work is partially funded by the Active and Assisted Living Joint Program under the SpONSOR project (AAL-2013-6-118 - http://sponsor-aal.eu/). Authors would like to thank Sergio Cametti for his enthusiastic participation in the project, for offering us the Televita case and for believing in what we are doing notwithstanding the difficulties of a dialogue between our so different worlds.